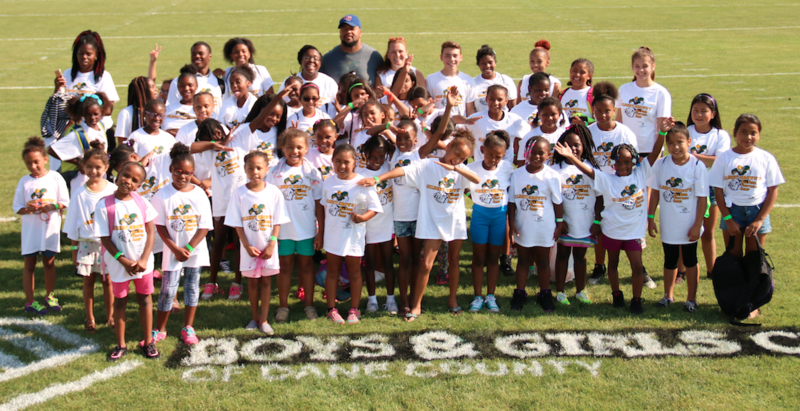 MADISON (Madison365) – Former NFL nose tackle and Green Bay Packer Super Bowl Champion Gilbert Brown was in town this morning to lead a camp for kids at Warner Park Football Field on Madison’s north side. Brown was a nose tackle who played for the Green Bay Packers from ’93-’03. He recorded 292 tackles (186 solo) and seven sacks in 125 games. Nicknamed “The Gravedigger,” in honor of his celebratory dance following a thunderous tackle, Brown played in 15 Packers playoff games including Super Bowls XXXI and XXXII. Kids yelled, “Yes, sir!” back at Brown every time he talked. Brown then introduced other camp coaches including Michael Johnson, CEO, Boys & Girls Club of Dane County; Al Toon, Former UW Badger and NFL Wide Receiver; Brandon Williams, Former UW Badger and NFL Receiver; Jonathan Clinkscale, Former UW Badger and NFL Lineman; Matt Bernstein, Former UW Badger and NFL Lineman; Haywood Simmons, Former UW Badger and Semi Pro Coach and Owner of Phitness Plus; Tiffany Loomis, Current Women’s Professional Football Player and team owner of the Madison Blaze; and Vernon Brown, semi-pro standout for the Madison Warriors.Boys & Girls Club, in partnership with The Gilbert Brown Foundation, came together this morning to kick off the three-day camp for kids. In partnership, these agencies have secured funding to provide a free football camp, cheerleading camp and sports media camp for children in Dane County. Brown introduced his old coach, Robert “Bob” Dozier, a 1993 inductee to the Michigan High School Football Coaches Association Hall of Fame. Dozier was a highly successful educator and football coach at Detroit’s Mackenzie High School and his 33-year career spanned five decades. The camps are free to area participants thanks to sponsors like The Gilbert Brown Foundation, Festival Foods, TOPS Promotions, Beacon Athletics, Madison Parks & Recreation, Madison Parks Foundation, Madison Metropolitan School District, Sleep Inn & Suites, Van Holten’s and HyVee. “If you want to be something out here, this is where it starts right here and right now. Right now! Take advantage of this stuff. Soak it up like a sponge,” Brown said before having the kids get warmed up by doing a series of sprints.